What are some of the things we do that get in the way of a close, connected and even passionate relationship or marriage? This is a good question and because we’re always asking ourselves how we can create more of what we want in our own relationship and how we can help facilitate that outcome for our coaching clients, we’re always looking for answers to that question. These blocks to more love, passion and connection can be different for everyone but one of the biggest blocks to a close, connected relationship happens when one or both people begin looking outside the relationship to get their needs met. We each saw this happen in our previous marriages and we’ve seen it happen in many relationships since then. When you look to food, work, a hobby, a friend, a co-worker, another family member, or even children for love or any other primary need–instead of the partner you chose to be with–your relationship with that person deteriorates. We’re certainly not saying that you can’t love food, your work, your friends, your family, or enjoy your associations with co-workers in order to have a great relationship with your mate. What we are saying is that when you are with someone, one of the primary keys to creating an outstanding marriage or relationship is to make them feel like they are the most important person in the world. Recently, we’ve been fascinated by Tony Robbins’ work with couples around this topic. One couple had been on the verge of splitting up for two years. The husband had the proverbial one foot in the door and one foot out and couldn’t make up his mind about what he should do. Since we talk with a lot of people who are in similar situations and are always looking for ways to strengthen relationships, this couple’s story was particularly interesting to us. As Tony asked both of them questions, one thing that became apparent was that each of them looked outside of their relationship to fill their needs. Do you do this in your marriage or relationship? Do you make anything else more important than your mate? What would they say about the idea of whether they feel like the most important thing in the world to you or not? In this situation where Tony was working with this couple, the woman was very close to her sister and had had a strong father who she had been very connected to. Although he had passed a year ago, it was apparent that she didn’t allow her husband to be as important to her as her father had been or her sister is now. The man seemed to also put other things in his life as a higher priority than his relationship with his wife. As Tony asked him questions, it became apparent that he chose to work long hours away from home to get his needs met. They were both looking outward and neither one had had the courage to turn around toward their partner to see if they could rekindle their love for one another, to be “there” for each other, and to be much happier in the relationship. Here are some ideas that you might try if you are in somewhat of a similar situation as this couple. 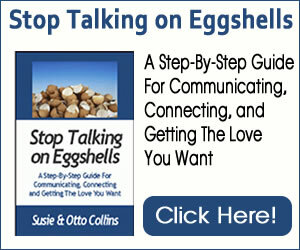 If you are between relationships and learning how to create what you want, these ideas may help you to understand how to create a close, connected relationship that stays vibrant and alive throughout the years. 1. Take a look at who and what you seek out when you are agitated or challenged in your life. This will give you some idea of how you choose to soothe yourself and get your needs met. As you become conscious of what you do during those times, decide whether you want to continue doing them or if there is a shift that you’d like to make that would bring you closer to your partner. 2. If you’d like to connect more with your partner at those times but you’ve held yourself back for one reason or another, you could begin by opening your heart and talking to him or her from that place about what’s happening with you. You could also simply ask for a hug at those times. Chances are that if you’ve made a habit of seeking out other people or things during times of distress, your partner may have disappointed you in the past. If that’s the case and you truly want a deeper connection with him or her, gather the courage and take the time to talk about how you would like to be supported–and then allow yourself to feel supported by them. In turn, you need to ask how you can support him or her. 3. Make a commitment to each other and a plan about how you both will move toward one another instead of away from each other. The commitment can simply be that you will spend more time together instead of apart. It might be that you will look to each other in times of distress instead of to others or to some other outside stimulation. The man in our example committed to be a powerful support to his wife and give her love in the way she needs. The woman in our example committed to making their relationship more important than her relationship with her extended family. toward creating more love within it–if that is your desire. If you are between relationships and want to have a loving, long-lasting, alive relationship, we invite you to create a vivid picture in your mind about how you’d like this relationship to be. Sometimes we aren’t aware of the blocks that prevent us from being happy and feeling loved. We invite you to take a look and move toward creating more love in your life.